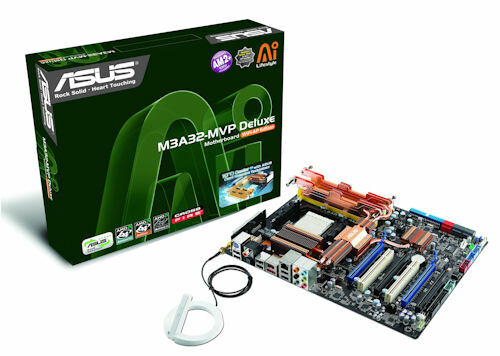 ASUS M3A32-MVP DeLuxe/WiFi-AP is today the most high-end motherboard for the AMD platform money can buy. Based on the new AMD 790FX chipset this board is targeted to the AMD gaming platform “Spider”, featuring four PCI Express x16 slots allowing up to four video cards working in parallel thru the new CrossFireX interconnection mode. As other motherboards from ASUS, this product has passive heatsinks, but what is unique about it is that it comes with a passive heatsink for the memory modules that can be attached to the motherboard passive cooling solution. This board also features an 802.11g (54 Mbps) WiFi access point, allowing you to share your Internet connection wirelessly without a wireless broadband router, eSATA port, coaxial and optical SPDIF outputs and much more, so read on. The second biggest feature of this new chipset is its support for the new PCI Express 2.0 bus, which doubles the bandwidth available for video cards from 2.5 GB/s to 5 GB/s, if they are also based on PCI Express 2.0 (so far the only PCI Express 2.0 video cards available are GeForce 8800 GT, Radeon HD 3850 and Radeon HD 3870). This chipset provides 32 PCI Express 2.0 lanes for graphics, which can be arranged as two PCI Express 2.0 x16 slots truly working at x16 or four PCI Express 2.0 x16 slots working at x8. More on this in a minute. The third biggest feature is the support for CrossFireX, which allows up to four video cards based on this new connection working in parallel. This motherboard features four PCI Express 2.0 x16 slots, which are physically identical to PCI Express 1.0 x16 slots, so you can install PCI Express 1.0 cards without any problem. If one or two cards are installed, the slots work at x16. If a third video card is installed, the first slot will remain working at x16, but the other two slots will work at x8. And if you install four video cards all slots will work at x8. The second biggest feature of this new chipset is its support for the new PCI Express 2.0 bus, which doubles the bandwidth available for video cards from 2.5 GB/s to 5 GB/s, if they are also based on PCI Express 2.0 (so far the only PCI Express 2.0 video cards available are GeForce 8800 GT, Radeon HD 3850 and Radeon HD 3870). This chipset provides 32 PCI Express 2.0 lanes for graphics, which can be arranged as two PCI Express 2.0 x16 slots truly working at x16 or four PCI Express 2.0 x16 slots working at x8. More on this in a minute.The third biggest feature is the support for CrossFireX, which allows up to four video cards based on this new connection working in parallel. one video card is used or 5 GB/s if two cards are installed. So HyperTransport 3.0 unlocks the maximum graphics performance of your system, even though for a perfect system we still need to wait for the release of Phenom CPUs based on the 10 GB/s HyperTransport bus. performance impact may be seen, as video cards transfer data at a rate far below their maximum theoretical transfer rates. This entry was posted on August 14, 2008 at 4:52 pm	and is filed under M3A32-MVP DeLuxe/WiFi-AP. Tagged: M3A32-MVP DeLuxe/WiFi-AP. You can follow any responses to this entry through the RSS 2.0 feed. You can leave a response, or trackback from your own site.